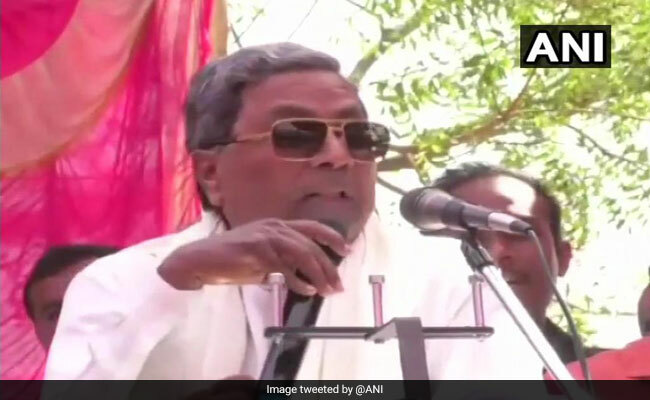 Former Karnataka Chief Minister Siddaramaiah on Sunday said he will not contest again from Chamundeshwari assembly constituency in Mysuru, where he had tasted defeat during the May 2018 assembly polls. "I appeal to you with folded hands...I will not contest from this constituency once again, I'm making it clear. You all should work together for the development of this constituency," he said. Speaking at the joint election campaign in Jayapaura of Chamundeshwari assembly segment in Mysore, he said "this constituency should develop. I have won here five times; this constituency gave me political birth." Mr Siddaramaiah, the then sitting Chief Minister, had lost the 2018 assembly polls in Chamundeshwari to JD(S) G T Deve Gowda by a margin of over 36,042 votes. He however won Badami, the other constituency in North Karnataka from where he had contested. Making his debut in the Assembly in 1983, Siddaramaiah got elected from Chamundeshwari on a Lok Dal Party ticket, He has won five times from this constituency and thrice tasted defeat. In 2006, he won the Chamundeshwari bypoll on a Congress ticket by a wafer thin margin of 257 votes against JD(S) candidate in one of the bitterest poll battles in the state. The results then were crucial for Siddaramaiah to score political points over his bete noire JD(S) supremo and former Prime Minister H D Deve Gowda, after being expelled from the party. After neighboring Varuna became a constituency in 2008 following delimitation, Siddarmaiah represented it till he vacated the seat for his son Dr Yatindra in the assembly polls last year and went back to his old constituency of Camundeshwari. Interestingly Siddarmaiah Sunday shared the stage after a long gap with old time friend turned rival G T Deve Gowda, who defeated him in the assembly polls, to campaign for coalition candidate C H Vijayashankar of Congress for the April 18 Lok Sabha polls. Congress and JD(S) joined hands to form the government after the December 7 2018 assembly polls after the election threw up a hung verdict and decided to face the Lok Sabha polls together. According to the seat sharing arrangement, Congress is contesting in 21 seats and JD(S) in seven. Congress managed to secure Mysore Lok Sabha seat as Mr Siddaramaiah was adamant about not ceding it to JD(S), which was also demanding the constituency, under G T Deve Gowdas leadership. The former Chief Minister appealed to both Congress and JD(S) workers to defeat the BJP in Lok Sabha polls. Sitting lawmaker Prathap Simha is the BJP candidate from Mysore. Mr Siddaramaih had earlier indicated that 2018 would be his last election.